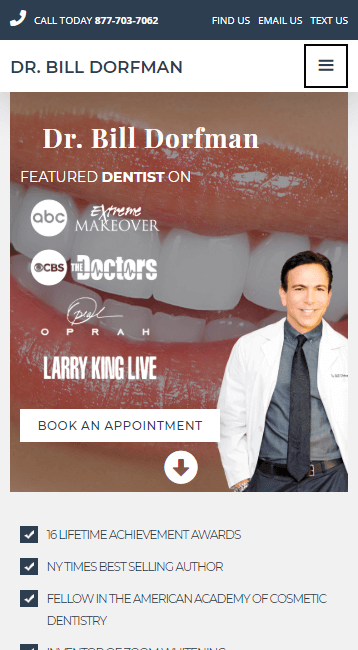 Dr. Bill Dorfman is a world renowned and famous celebrity dentist that performs top tier cosmetic dental procedures. He's been featured on Oprah, Larry King Live, ABC's Extreme Makeover and The Doctors. My challenge was to redesign a website that not only reflects the quality of his work, but also promotes a healthy experience for his demographic and encourages visitors to book consultations. I adopted a human centered design approach to get initial direction and then progressed into complete website implementation using UX strategies, prototyping, research, inquiries and development. 90% of all interviewees first checked the website from their mobile phone. Of those users 70% of them were not impressed with the visual design of the mobile website. 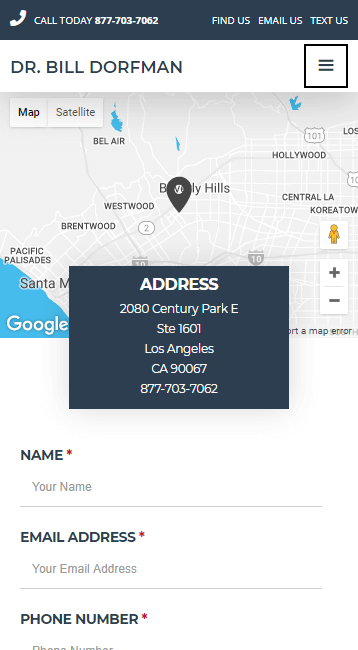 Website poorly promoted the services provided. High visitor bounce rate due to poor overall experience. Users found the website to be over promoting, making it seem as if it was making up for "something". Dr. BIll's vision for his business. The value proposition of his services. General idea about patients and their goals. The website navigation was complicated and contained unnecessary links. The website lacked clear visual design. Copy and structure lacked composition and story. Mobile friendly, but not responsive. After highlighting the key areas that required validation, I constructed interview questions to fit the framework of how a user would seek and use the website, what they were looking for and how likely they were to book an appointment. During a brief trip to Los Angeles, I approached random individuals in cafe's and in dental office waiting areas. The ideal number of interviews was set to 8, but due to limited time, only 4 interviews were conducted. 3 of the interviewees were female and 1 male. This divisional approach was in-line with the initial client statistics provided in the stakeholder interview. Users like to see lots of before and after photos. Users favor off-site reviews VS on-site testimonials. Users liked to see photos of the clinic to get a sense of the environment. 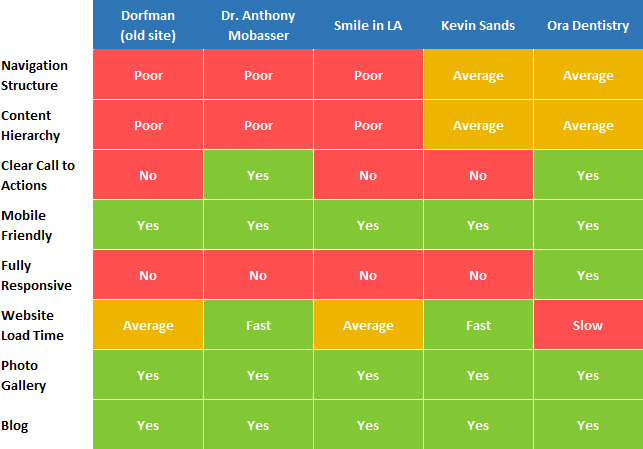 Users wanted detailed information about the doctors they'd be visiting; including their education and accomplishments. View relevant before and after photos. Use dental websites on their smartphones. Navigate through complex and bulky menu systems. Associate quality with poorly designed websites. Cosmetic dental procedures are not covered by most insurance companies, and therefore costs are payable out of pocket. Users are generally nervous and, often times, afraid to visit a dentist. Users want to be out of the dentist office as fast as possible. "The first impression is the last impression"
Nina works as a real estate agent in North Hollywood and specializes in homes priced at over $1 million. She considers her smile and teeth to be among the top items that make her appearance presentable and boost her confidence. Needs to improve her smile. Needs to find her clients the best properties. Needs to establish further industry credibility. Needs to increase her peer network. Wants to open her own agency. Is insecure about her smile. Needs to save more money. Needs minimal downtime from work. "Hard work isn't enough. I need something more." 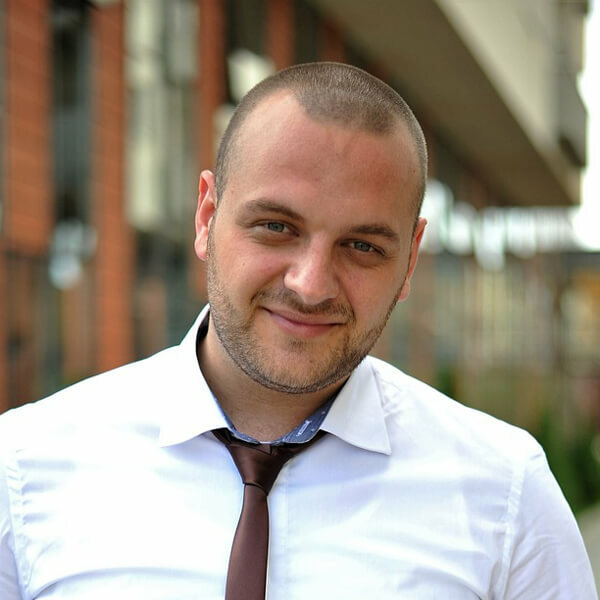 Darren works in creative agency and routinely handles various accounts. He is required to build and maintain relationships with his clients, and often seek out new business for the firm. Wants to get a promotion. Wants to get married within the year. Needs to impress and secure new clients. Is insecure about his smile. Smoking caused damage to his oral hygiene. 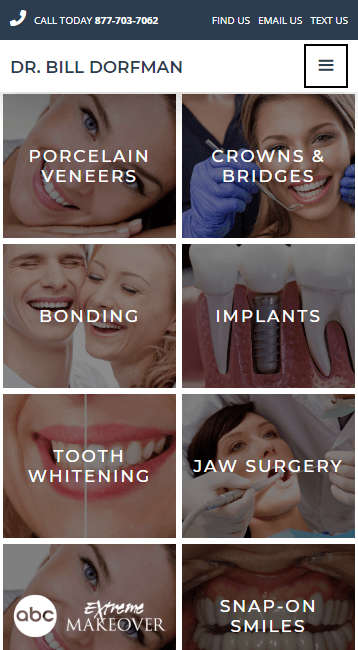 I worked closely with Dr. Dorfman's team to create a completely custom and beautiful website that truly represents his brand, skills and accomplishments to his patients in a way that promotes all his dental services. The new website has been built to offer a new and improved user experience for his patients in the interest of increasing conversions and client loyalty. The website needed to embody smart phone, desktop and tablet operation with the user having the same experience irrespective of device. The site is also totally scale-able for future developments, brand growth and extension.